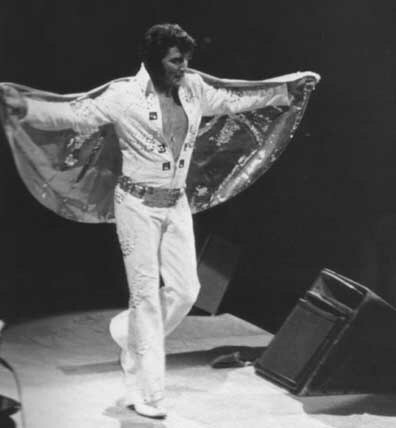 Elvis showing his gold cape (Joseph A. Tunzi). On Friday night, June 9, an air of shabby carnival hung over Seventh Avenue. The sidewalks around Madison Square Garden teemed with kids and toothless old men hawking Elvis pennants, Elvis posters, albums of Elvis pictures. There were cops on horses and cops on foot, and vendors with brown paper bags containing Elvis T-shirts circulated among the ticket-holders. But few ticket-holders stopped to buy. They kept moving towards the arena, their excitement so palpable it seemed to cut through the muggy twilight. Elvis Presley had never before sung a live concert in New York, and some of these fans had been waiting 17 years. Inside the Garden, excitement turned to awe. Around a raw wood stage were ringed thousands and thousands of seats and, by the time Elvis came on, every one of them would be filled. Not to see a hockey game, or a world championship prizefight, but to view - in person - one man. One man can fill this place, you told yourself in disbelieve. All by himself, he's a team, he's a convention. It was my husbands opinion that the crowd had been lost, that between irritating announcements about the "limited supply" of mementos which could be had for two bucks apiece, and the ritual murder of the comic, some spirit of anticipation had been broken, a sweet eagerness had turned rancid. He was wrong. At 9:15, Elvis appeared, materialized, in a white suit of lights, shining with golden appliqués, the shirt front slashed to show his chest. Around his shoulders was a cape lined in cloth of gold, its collar faced with scarlet. It was anything you wanted to call it, gaudy, vulgar, magnificent. He looked like a prince from another planet, narrow-eyed, with high Indian cheekbones and a smooth brown skin untouched by his 37 years. He was girdled by a great golden belt, a present from the International Hotel in Las Vegas for breaking all attendance records and when he started to work with the mike, his right hand flailing air, his left leg moving as though it had a litf of its own, time stopped, and everyone in the place was 17 again. It was a lesson in dominance; we had just seen the comic who couldn't control anybody, not even himself, and that had got us nervous; now Elvis made it all right again. The music was mixed, old rock with new, he did "Bridge Over Troubled Water" and the ballad where the fellow asks the girl to lay her warm and tender body next to his, but it was when he'd got to one of the old Elvis numbers, "It's Allright Mama" or "Love Me Tender" that the Garden came unglued. It was 1956 again, and I heard a man who was pushing 40 ask his daughter "Ain't he better than Tom Jones?" and the daughter said yes, and the father smiled: "That's all I wanted to hear." Once in a great while-a special champion comes along, a Joe Louis, a Jose Capablanca, a Joe DiMaggio, someone in whose hands the way a thing is done becomes more important than the thing itself. When DiMaggio hit a baseball, his grace made the act look easy and inevitable; whether it turned into a pop fly or a home run, it was beautiful, because he did what he did so well. Friday night, at Madison Square Garden, Elvis was like that. He stood there at the end, his arms stretched out the great gold cloak giving him wings, a champion, only one in his class.